Though similar to horses in many ways, donkeys have many unique characteristics, and parasites in donkeys are no exception. Donkeys are affected by strongyles (Roundworm) and tapeworm, just like horses, but there are two other significant parasites. Donkeys, unlike horses, can carry the full lifecycle. 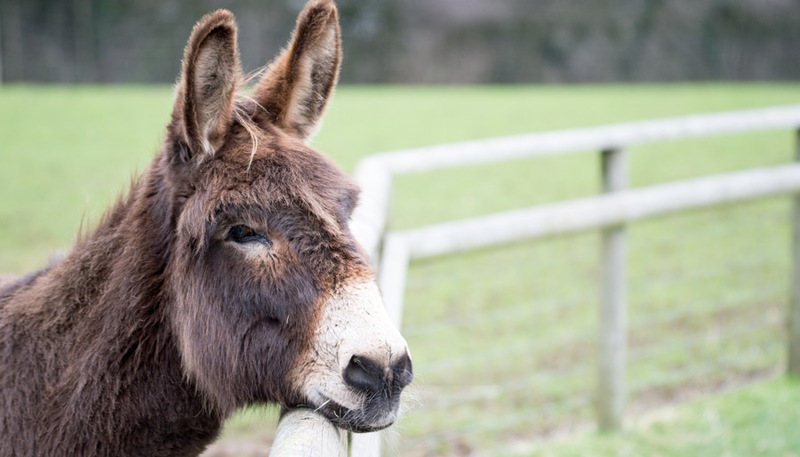 Healthy donkeys rarely develop clinical signs, but in horses, an infection can cause severe coughing. A ‘zero tolerance’ approach should be taken to Lungworm as once established eradication can be a lengthy process. Donkeys grazing wet, marshy paddocks are at risk of liver fluke, and may be at particular risk if grazed with other infected livestock (e.g. sheep or cattle). Parasite control is about far more than just worming. Targeted worm control provides a tailor-made approach designed by our vets, taking into account your individual donkeys needs. With resistance to wormers (where previously effective wormers no longer kill the worms) increasing it is essential that we reduce our reliance on them. For donkeys, we advise three dung samples to be examined every year, with strongyles evaluated in each and both Fluke and Lungworm to be assessed in one of these samples (spring or autumn). A new donkey should have a full screen on arrival. Kits can be collected from the surgery, and our equine vets will tailor your programme to your donkeys’ specific needs. If control measures are in place within a stable adult population, donkeys will require FWEC to be carried out in April, June and Sept/Oct. Should a result over 200 eggs per gram (EPG) be detected then appropriate dosing and repeat FWEC to ensure response will be required. These tests do not identify tapeworm, so we advise that horses are dosed at least in the autumn, possibly in the spring too if particularly at risk. There are blood and saliva tests available, and we are more than happy to discuss the pros and cons on an individual basis. If possible keep donkeys with the same grazing companions, not continually changing groups. Rest and rotate grazing and don’t overcrowd fields. Cross graze, e.g. with sheep. Keep new donkeys separate until tested and treated accordingly.